Both black and green tea are drunk here. 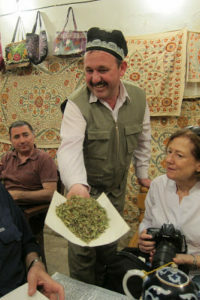 According to our local guide Galip green tea is favoured in Samarkand, Bukhara and Khiva because it beats the heat while in Tashkent and Fergana, they prefer black. It is not usually sweetened, unlike Turkish çay, and if it is, it would be at breakfast time. 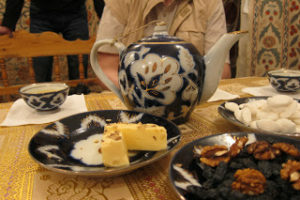 Yesterday we were taken to a teahouse or chaihana right in the heart of the bazaar area of Bukhara to sample herbal teas. Actually it was a fabulous suzani shop as you can see from the photos! 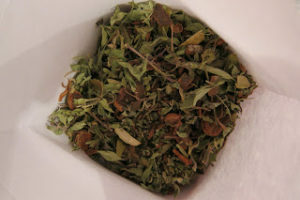 The tea leaves had a beautiful light fragrance and made a delicious tea. I don’t know the proportions but one could experiment. Of course it was for sale: 100g which would make 60-65 small pots, cost 15,000 som. This sounds like a phenomenal amount but in fact is only $7.50. I say of course because everything here is for sale! The tea here is not brewed like in Turkey. 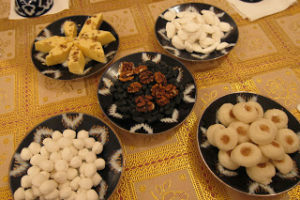 It’s made by putting spoonfuls of tea leaves in a pot, covered with boiling water and left to infuse for a few minutes, just like making a pot of good old English! Notice the cups: this pattern is seen everywhere for some reason: the dark blue with the white. As you can see, this tea place was in reality a fabulous suzani shop and yes, we did all either buy something there and then, or came back the next day when we had ‘free time’! More about that later. Shopping here is absolutely fantastic!!! Previous Post: « I’m in Bukhara! I envy you Claudia Hanim :-). I couldn't have a chance to visit Bukhara but my trip to Samarkand was unforgettable. 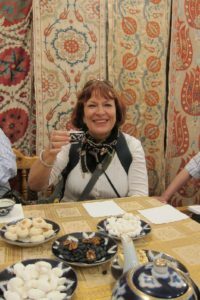 Please ask your guide to take you all to the place in the centre of Tashkent where you can find National Uzbek dresses and fabrics made from silk. You will like the lovely colors. You should buy an Uzbek dress. Enjoy your trip! Hi Julia! yes, what a place! Thanks for your comment re photos!Always nice to hear from you. Hello Sarahworld! Thanks for your comment too – so nice to hear from you again and thank you for sending me an award! Feels great to be back in terms of blogging! What must I do?? Hi Ipek! So nice to hear from you like this! I loved those Uzbek dresses but ran out of money! When did you go there?